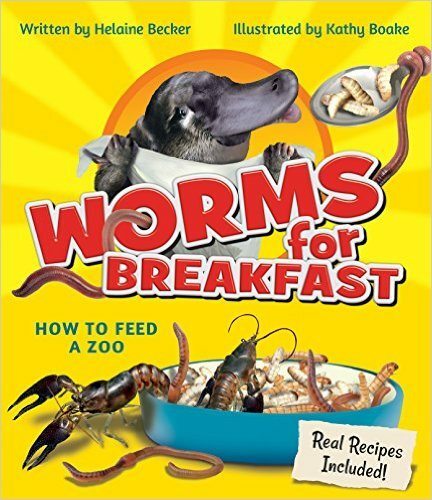 Toronto author Helaine Becker serves up a treat with her latest offering, Worms for Breakfast. The book covers the gamut of what and how zoo animals eat, from the insects favoured by nocturnal pangolins to the herring gobbled up by fish-loving pelicans. Feeding and satisfying such a wide variety of palates is a huge job for an animal nutritionist, as Becker reveals. The author is also careful to underline the importance of natural habitats and to point out some of the issues involved with keeping wild creatures in captivity. Becker writes in a friendly, conversational style and sprinkles plenty of entertaining facts throughout, such as how much poop an elephant produces, and the special food on the menu for Diwali (bears get honeyed rice pudding) and other celebrations. But it’s the delightfully gross recipes – mealworm mush, anyone? – that take the book up several notches in the fun department. Becker includes real preparations and facts from zoos and sanctuaries around the world. For example, a koala sanctuary in Australia blends up a special mixture of eucalyptus leaves and infant formula for sick animals. Becker calls it “Presto Pesto Sauce – Koala Style.” Meanwhile, California’s Birch Aquarium mixes up “Kelp Tank Goulash,” a daily dish of krill, clams, squid, smelt, and mackerel for the eels, leopard sharks, and other sea creatures in the tank.